Events, people, and things of interest at iCLA–from the student perspective. YGU Wind Brass Ensemble in season-appropriate attire. Liam Gingell (guitar) and Koki Yamada (bass). Pauline Arejola as a businessman. A captive Winter Gala audience. Ninja Workshop with a professional Ninja, Narashino-san! Students carving their own Hanko Seal in a workshop for the Calligraphy Class. Field trip to experience Aizome, traditional dying of cloth with plant dyes in Japanese Indigo Blue. Kagura Dance workshop for the Shugendo Class. Experiencing a traditional Tea Ceremony at Erinji, with a Tea Master. The Calligraphy in the alcove is a rare original by Sen no Rikyu. Japanese Taiko workshop performed at Yamanashi Gakuin by members of Cosmos from Gunma Prefecture. 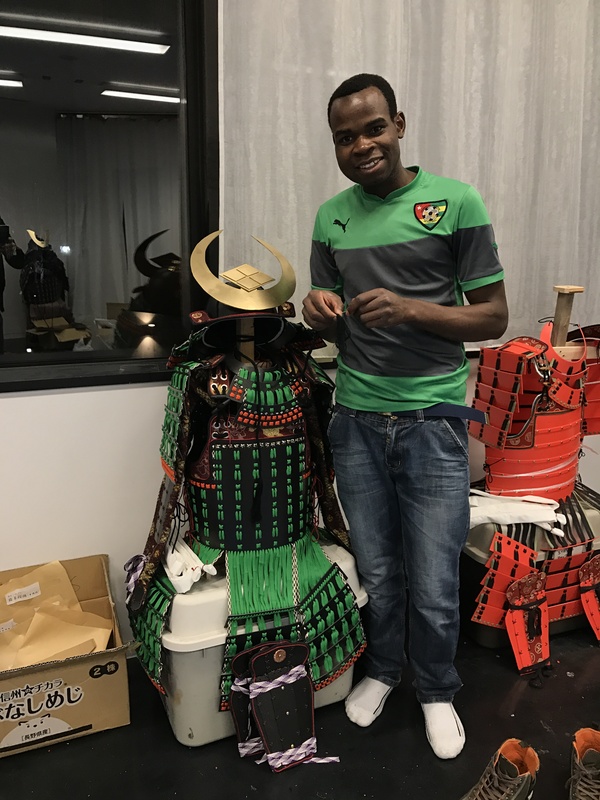 iCLA students do amazing work building their own Samurai Armor from scratch. High-quality Armor, the threads customized in the colors of his native country Zambia. Students in the Shugendo Class learn many skills from Japanese Samurai and Ninja traditions, such as how to draw a Japanese sword. iCLA Aikido students teaching visitors from a local High School how to hold a wooden sword, as part of their iCLA workshop experience.